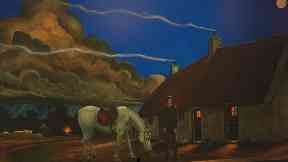 The Tam o' Shanter paintings have gone on display at Glasgow's Oran Mor. Ten large-scale paintings depicting the story of legendary Robert Burns poem Tam o' Shanter have gone on display at Oran Mor in Glasgow. The murals, created by artist Nichol Wheatley, took two years to complete and were commissioned to coincide with the 260th birthday of the poet. Tam o' Shanter is one of Robert Burns' longest and most famous poems. It was published in 1791. Mr Wheatley said painting the iconic tale had always been his dream. He said: "It's a delight because I love this poem - I've loved it since I was a kid. "I'm really honoured to have been asked to do it. 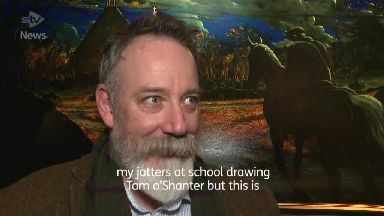 "I found sketches from when I was about 12 in my jotters at school drawing Tam o' Shanter but this is the first time I've had a proper commission to paint Burns." The paintings are currently hanging in the venue's auditorium and will be displayed during Burns events on the run up to January 25. 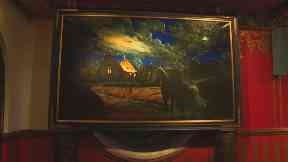 After Burns Night, the paintings will be moved to the Whisky and Victorian bars, which will be their permanent home. Colin Beattie, owner of Oran Mor, said: "I believe that Nichol's rendition of the ten paintings created for Oran Mor will prove to be a truly significant addition within the canon of Burns art. "Nichol's work is simply magnificent and I have no doubt it will stand tall amongst all other great Burns art that has preceded it. "The creation of Oran Mor was to encourage 'art for all, all year round' and it is important to me that we support Scottish artists." He added: "I'm confident that this commission will help to bring Burns to a new generation."